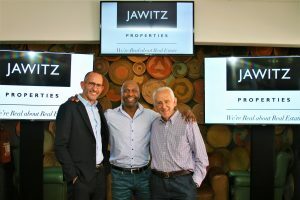 EX- LEEDS United FC skipper, Lucas Radebe was the centre of media attention at the Sandton Sport Club in Parkmore on the occasion of teaming up with the Jawitz Properties group for the launch of the #RealLifeRealEstate content series. 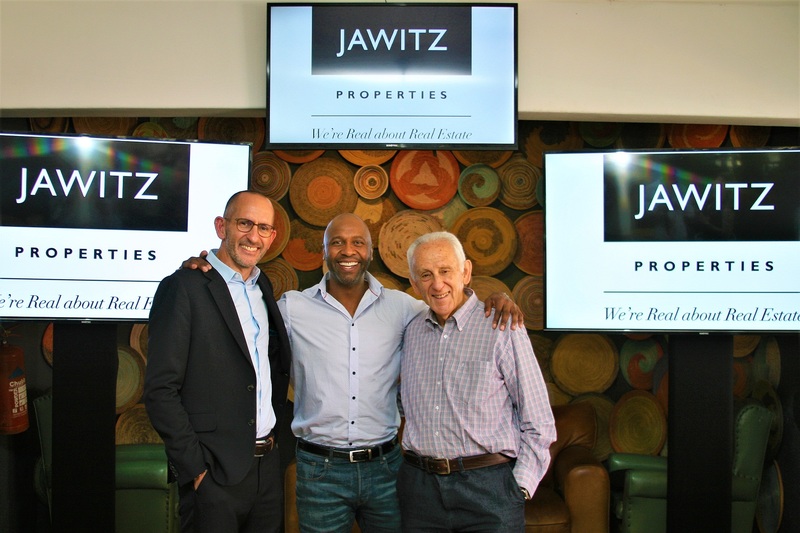 Herschel Jawitz (left), Lucas Radebe and Eskel Jawitz at the Milky Bar, Sandton, at the #RealLifeRealEstate content series launch. Image Jacob MAWELA. With omnipresent celebrity, the bespectacled Masego “Maps” Maponyane present at the Milkbar restaurant venue, the man fondly referred to in local footballing circles as, “Rhoo” diverted from his speech by acknowledging the presence of the younger man-about-town by pointing out that “he played with his father” – alluding to erstwhile striker, Marks “Go-man-Go” Maponyane. Given his entity’s association with a soccer legend, Jawitz Properties CEO, Herschel Jawitz went out of his way to tease the one time Bafana Bafana captain that he was “a fan of the team which never lets you walk alone” – alluding to Liverpool FC. The good-naturedly banter seemed in place since the very occasion assembled for sought to distinguish a house from a home. A man of half-full or half-empty approximations, the younger Jawitz, whose father and the entity’s chairman, the octogenarian Eskel was in attendance – delivered an upbeat address in which he hinted at his cautious optimism regarding South Africa’s economy, a mood reflected by the residential market within which his concern operated. “South African residential property prices are dropping when adjusted for inflation and it now takes an average four months for a residential property to be sold”, he said. Declaring that he was proud to have Radebe as his entity’s ambassador, the executive suggested the association could only serve to enhance the soccerite’s own brand standing. “For Jawitz, homes are more than just inventory or stock, they represent memories of sellers and dreams for interested buyers. We are delighted to have Lucas on board, sharing his story, in order to encourage South Africans to share theirs”, he continued. Prior to the commencement of proceedings, the Jawitz honcho, in an interview on the sideline of the launch had defined why his agency came to settling on Radebe as a business partner – pointing out that they shared values based, inter alia, on ethics, integrity, reputation, community initiatives and describing the former defender as being loved and one distanced from controversy! When his turn to address attendees came, Radebe began by reflecting, “When you grow up, you don’t foresee your dream”, adding that was it not for his mother – he could have taken a different career path. Claiming that Jawitz slogan resonated with him, Radebe also revealed his being impressed about the authenticity of the stories he came to learn of, during the recording of the series. Mentioning that he hailed from a family of ten children, “Rhoo”, who was once shot with a gun whilst going about his personal business in his hardscrabble neighbourhood of Diepkloof, Zone 4 – offered that when two brands came together, they beget success. Further suggesting that his merely having an impact on young people said a lot about his credibility as a person, he also referred to the value he put in the partnership and respected who he worked with, whilst appreciating the fact that the initiative was geared toward ordinary people. Two video snippets of the series were shown at the launch, with the first one depicting a 4-roomed house in Diepkloof with mum’s cooking awaiting him after a game of football; the times spent in Bophuthatswana and at Leeds and the experience of his late wife’s ailment. And with Radebe declaring that there was nothing like coming back home! In the campaign premiere of the content series, Radebe shares the trials and tribulations of his #RealLifeRealEstate journey. “It was the authenticity of the campaign that lured me to this project, as well as the rewards that are on offer to the average South African,” he concluded. The post-event press release of the launch guides thus: “An integrated social media campaign encourages South Africans to submit their #RealLifeRealEstate stories with @JawitzProp on Twitter, @Jawitz.Properties on Instagram, and via Facebook. The brand will be surprising and delighting fans this festive season with appliances, vouchers for home furnishings and even the possibility of contributing to rental and property upgrades for someone in need, through various regional radio campaigns”, concludes Jawitz. The campaign runs from 15 November 2018 to 28 February 2019.
soccer lover on Will the Westbury outfit La Masia defend their Walter Sisulu Challenge Cup? Marodine on For R35 you can start your own business with Avroy Shlain brands!